Ingeegoodbe (outside) has responded to a low-key build-up to win at Eagle Farm for Robert Heathcote. 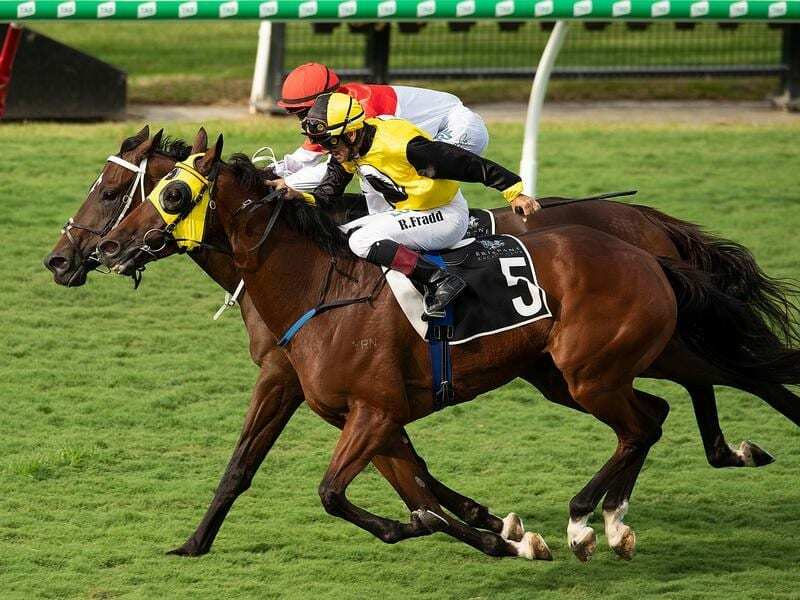 A decision to be patient with Ingeegoodbe paid off when he confirmed his rating as a future top stayer at Eagle Farm. Ingeegoodbe ($8.50) won a slogging battle with Bergerac ($3.90) to score by a head with two lengths Emphasis ($4.60) in third place in the Events @ BRC Handicap (1800m). Trainer Robert Heathcote decided to take a low-key approach with Ingeegoodbe during the summer carnival and waited to get him out to a suitable distance. “His two runs since a spell have been very good at unsuitable distances. He was third-up today and starting to get out to his right distance,” Heathcote said. “I have always said he was a possible top stayer at 2200m and 2400m. I don’t know about the winter carnival but there is a 2200m race at Eagle Farm in a fortnight. Ingeegoodbe has now won eight races and more than $300,000 for owner Ange Duncan who is one of Heathcote’s biggest supporters. “I say it often but it gives me a real thrill to win a race for the Duncans because they have been such great supporters,” Heathcote said. Winning jockey Robbie Fradd said things had worked out as planned with Ingeegoodbee able to get a crack at the leaders about the 250m. Bergerac, who was having his third start in three weeks, fought on well for second but is now likely to go for a spell. Trainer Tony Gollan and owner Linda Huddy have spelled their star sprinter Most Important but are still celebrating plenty of success. Gollan got a treble and Huddy a double when MacEwen ($7.50) won the Moet and Chandon Handicap (1200m). Gollan had earlier trained a winner in Get Stuck In for Huddy and also prepared two-year old Garibaldi for victory. Huddy and her husband Graham have horses with many trainers around Australia but Gollan has the majority in their home state. “MacEwen is yet another horse who has taken time to mature but I have always felt he would be a Saturday horse,” Gollan said.